Steve Cameron: Science Fiction & Fantasy Author: A Parcel Of Rogues At The National Theatre. I've bought my tickets to see Steeleye Span next week. They're touring to celebrate their 40th anniversary. While my wife cringes every time I plays their albums, and I think I'm now only allowed to listen to them when she's not home, I'm fortunate that my best friend also loves their music. So we'll have dinner, a drink and then down to the National Theatre for the show. This will now be about the fifth time I've seen them live. I was fortunate enough to see them a couple of times with their classic Mark IV lineup, the band that recorded the wonderful Commoner's Crown album. I wasn't going to write about Steeleye, but I've spent the past few days listening to some of their CDs. And you have to love their storytelling. Little Sir Hugh, Long Lankin, even Demon Lover - wonderful stories, some dating back as far as the 13th century, that are as dark as anything else I've seen. Tales of murder, infidelity and meeting the devil abound. Lots and lots of themes and ideas lie within their discs, just waiting to be harvested for reuse in some of my current stories. 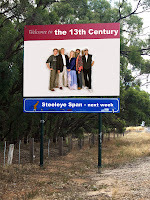 I recently listened to Present, a collection of re-recorded Steeleye songs. The playing is accomplished enough, but it doesn't groove, it doesn't swing. It's not something you can describe, but it's something you can feel when you listen to it. At first I wondered whether it was simply because I was more familiar with the old favourites, but it's more than that. There's something missing - a bit like comparing Gimme Shelter from a recent live recording to the original dark, threatening Let It Bleed version. The Rolling Stones are more accomplished now, but there's a feel that's absent. But that's not to say that Steeleye Span still aren't fabulous, The current line-up (similar to the one I saw a couple of years ago) is still fantastic, and Maddy Prior's voice is still one of the purest I've ever heard. And while my wife stays home and watches some chick flick, I'll be dancing (at least in spirit) to All Around My Hat.